This is the performance cruiser other bikes wish they were. The dark and muscular M109R B.O.S.S. has a powerful V-twin engine using some of the largest pistons in the industry - a bike that will get your adrenaline flowing whenever you ride. This 109 cubic inch engine is wrapped with aggressive blacked out styling that includes slash-cut mufflers, drag-style bars, a supplied solo seat cowl, and a distinctively shaped headlight nacelle that's uniquely Suzuki. This bike is not just about looks, as stout inverted forks, a hidden single-shock rear suspension, and an ideally designed saddle deliver responsive handling and an exceptionally comfortable ride. Performance never looked so good, or so dark. 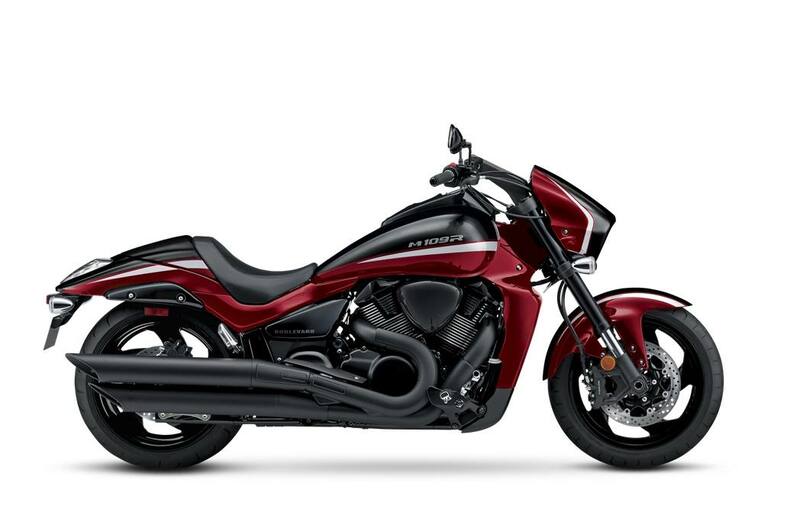 Choose from a pair of new, two-tone paint schemes on the 2019 Boulevard M109R B.O.S.S. - Glass Sparkle Black/Candy Daring Red scheme with black wheels or the Pearl Glacier White/Pearl Vigor Blue treatment with metallic blue wheels, matching the bike's graphics. 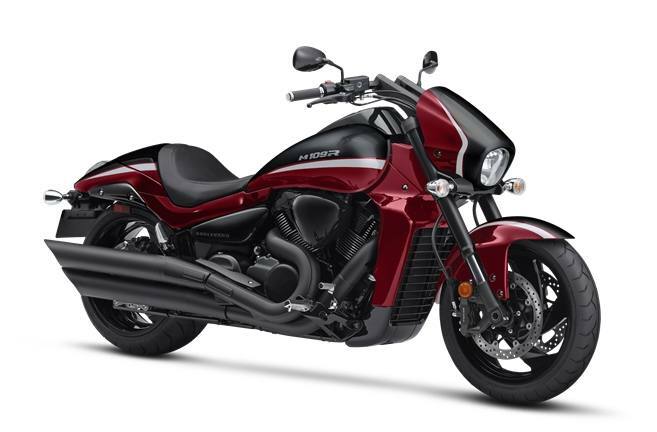 Both high-quality color treatments visually announce that this is a serious muscle cruiser and true to Suzuki's performance heritage. The deep, rich paint is flawlessly applied to a long, imposing muscle cruiser that's unlike any other. From the distinctive headlight nacelle to drag-style handlebars and massive 240mm wide rear tire, this motorcycle is a class of one. The M109R's bodywork is sleek and purposeful from nose to tail and looks even sleeker when the optional tail cowl is on in place of the passenger seat. Similar to the brakes from a Hayabusa, the M109R's radial-mounted, dual front brakes deliver sure stopping performance. The large-diameter inverted fork and the 240 mm wide rear tire give the bike a tough, aggressive stance that also delivers a smooth, controlled ride. The M109R B.O.S.S. (Blacked Out Special Suzuki) features the following: • Blacked out exhaust system, clutch cover, magneto cover, cylinder head covers, air cleaner cover, and final drive case. • Blacked out handlebars, clutch and brake levers, handlebar switch cases, rearview mirrors, fuel tank/instrument cover, front and rear wheels, front and rear brake calipers, frame side covers, rear fender stays, sidestand, steering stem clamps, and front forks.• Clear tail light and turn signal lenses. 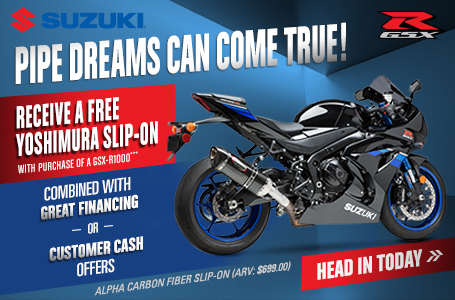 Extension: Longer warranty coverage period with other benefits are available through Suzuki Extended Protection (SEP).